As the Tory government staggers from pillar to post, split many ways over Brexit, the prospect of a Jeremy Corbyn-led government becomes more real by the day. That’s why making preparations now for the attacks it would inevitably face is critical. 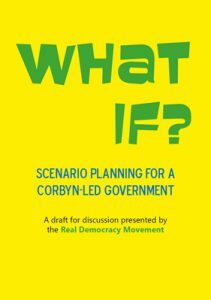 Brought together by the issues raised in ‘What if?’ published by the Real Democracy Movement in June, four working groups debated scenarios in the pamphlet and others that did not figure in the original publication. Here are their key conclusions which should be read in conjunction with ‘What if?’. – Need to educate people about the nature of the economy, how finance is extracted, for example, with readily understandable stories. – Should do case studies of past crises e.g. Syriza in Greece, Chile in the 1970s, Mitterrand and the ‘austerity turn’, Iceland in the wake of the 2008 crash. – In the UK, what did the civil service prepare in the eventuality of a failure of the 1976 IMF loan talks? We need to have access to this. – A socialist government can create its own money, which is at present predominantly issued by commercial banks. – At the moment we don’t have the capacity across the board to implement both to deliver the transformation and to respond to some of the difficulties posed. – For example, with an increase in co-operatives, we have to devolve power and give people the technical ability at grassroots to run them. – Set up a study of how to shrink the financial sector. – Make plans for an international conference to plan a post-neoliberal economy. – Work on the assumption that MI6 and the military are not sympathetic and will work against a possible Corbyn government. – Have to identify the difference between covert and overt action. For example, the use of the state against the miners and activists and covert action by MI5/6 and the military. – Beware of threat of blackmailing senior labour figures. – Understand how the state can sow discord inside leftist organisations, creating an atmosphere of paranoia and distrust. – Learn from the coping tactics of communities who are singled out by the state e.g. Muslim communities and other minorities. Build mutual solidarity with them. – Openly confront secret services and make public what they are doing and make them accountable for their actions. – Be on the lookout for whistleblowers and leaks from within the state. – Use the existence of a mass movement to defend the government. What if there is a revolt from within the Parliamentary Labour Party? – Who can be trusted? Experience of Chris Mullin. Large sections of the PLP are not socialist. They see capitalism as the only show in town and are committed to preserving the system. – First time ever that socialists are in the leadership of the party so there are bound to be attacked from within. – In addition, many local councillors will be hostile to a Corbyn government. They are entrenched in local areas, using the cabinet system to hold onto power. They can be part of the problem. – Momentum is engaged in training a network of potential left councillors who can eventually become leaders in the area and make selection of left MPs more likely. This will take time because the right-wing is embedded in many constituencies. – Changes in the party’s constitution are under way but selection of candidates is not up for immediate consideration. – There is a Corbyn movement not because of Westminster but because of the problems with Westminster politics. We should campaign for alternatives to representative democracy to move power away from the centre. – Need to reach out to communities now. Work with them, get them involved in drawing up the manifesto, so it’s their manifesto as well. Ask them how Labour can work with them to ameliorate their conditions. – Labour Party should work with and pay other organisations to increase participation in local meetings that could take the form of assemblies (example of Croydon Assembly made). – This is all part of building a social movement to support Corbyn and the leadership must help local communities to raise aspirations. – Contacts should be made with progressive international movements. What if the media destabilises things? – Respond with active and responsive intervention on social media. Focus on strengths/upsides of policies. A real change to the country. – Campaign for democratising the media – e.g. Levenson reforms. – Review by relevant experts and public oversight. – Education – where does a story come, what is its source, the role of the editor and role of the publisher? Most people know little about this process. – Create a fund for alternative media and platforms that is distributed through an independent, third-party process. (Novara media has some ideas on this). – Create rival search engines, alternatives to Facebook etc. – Reach out to sympathetic journalists and experts in BBC and papers like FT.
– Rise of the far right. UKIP is now being taken over by neo-fascists. – Climate catastrophe. Apocalyptic climate event. What would the response be? 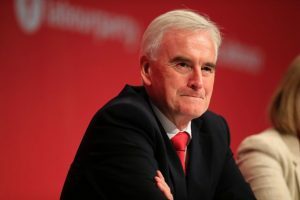 – Overcoming divisions within our own movement over, for example, Trident by creating working group to study and propose conversion of defence industry. – A financial crash, when there is apparently no money for a second bail out. – Rewrite ‘What if?’ to incorporate conclusions listed above and take scenario planning out to a wider audience, starting with The World Transformed in Liverpool in September. Mean while, you can download a copy of ‘What if? here. Thanks to the tech co-op Outlandish for hosting the event. Paul, thank you for your blog post.Really thank you! Awesome.